Synopsis: Journalist Anne Roland explores the disturbing links behind her friend’s sudden disappearance, an ominous government research chemical, and a disturbing radio broadcast of unknown origin. Those who read my reviews know I usually start off with the bad and the ugly. 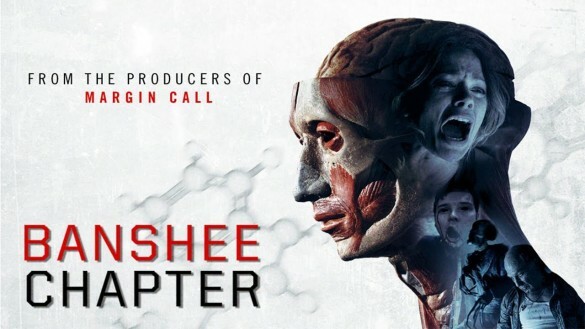 Banshee Chapter does an excellent job of keeping the surprises coming, has outstanding acting and character development and most importantly has a script that will even haunt Freddy Krueger. It is very difficult to make a good horror film these days as there is really nothing left to do to try to scare the audience. The greatest ploy studios try to do is summed up by the following, “Based on a true story”. The Conjuring is the last real horror movie that I like because it had character development and the cheap scares were kept to a minimum. Banshee Chapter is a movie that probably many have never heard of. Banshee Chapter is the successful result of mixing in some H.P. Lovecraft’s From Beyond, The Blair Witch Project, and the real-life Project MKUltra experiments conducted by the U.S. Government from the 1950s to early 1970s. No film is ever perfect, however this movie comes as close as you are going to get to it. Writer/Director Blair Erickson knows how to make a good horror film so I hope everyone in Hollywood is taking diligent notes. Erickson just does not have things pop out at random times to generate “fear”. Erickson builds up the jump-scares that get scarier and scarier with each new detail that his characters’ discover. The film starts off with real footage of government officials announcing the existence of the government experiment Project MKUltra. After the scene we are introduced to a young man named James (Michael McMillian). James takes the drug used in the experiments, dimethyltryptamine-19 (DMT-19), only to start to experience an extreme amount of anxiety and announce that something is coming when suddenly James looks like an extra straight out a Paranormal Activity film. His friend and journalist Anne (Katia Winter) undergoes the daunting test of finding out what happened to James. Anne uncovers a government conspiracy surrounding the drug and its connection to creatures from another dimension. Anne meets a very interesting character by the name of Thomas Blackburn (Ted Levine), who did make contact with James before he disappeared like weed in the hood. What happened to James? The engine that powers this movie and watching the characters uncover secrets is a thrill to watch. Erickson makes sure that we only get a scope of what’s going on so it keeps us wanting more. I’ll explain it like this: You start dating somebody new and you are ready to take your relationship to a level only R.Kelly can take you. On the big day they send you teasers and gets you excited for the night. It’s that the same level of excitement that Banshee Chapter gives you. You know what I love? A movie that has standout performances and this movie had not one, but two. Katia Winter was great in the role of Anne and was able to sell the scares pretty convincingly, even know towards the end of the film we get tired of them like a lazy roommate. Ted Levine, who played Thomas Blackburn also did a job worth commending. The relationship that this two develop on-screen is well crafted and it leads somewhere I did not see coming. In a movie like this, the performances need to sell the experience they’re having and these two do it really well. Horror films are the easiest scores to compile and Andreas Weidinger’s score fit the tone of the film perfectly. The score consisted on a mixture of short and long sets that help increase the scares in the film. My personal favorite sets are “The Lab” and “The Radio Shop”, great tracks. Overall, Banshee Chapter is a great film that will be great for any horror fans because of how well it is but together. Banshee Chapter is playing on VOD, Google Play and other outlets, so really there is no excuse to not see this movie.